Magenta-Magenta Cling Rubber Stamps. These stamps feature high- density cushion with a smooth layer that clings to your acrylic blocks. The images are crisp and precise so your projects turn out great every time! 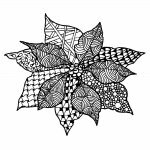 This package contains Zentangle Poinsettia: one 3-1/8x2-5/8 inch stamp.